Do you like match-3 games? What about watching WWE shows and enjoying big guys hitting each other? If you answered yes either or both questions, we have good news: WWE Champions, developed by Scopely, gives you both. This puzzle game has amazing quality graphics and fast gameplay – if you’re looking for a casual and fun game, WWE Champions may be the best option for you. Let’s take a close look at this wicked match 3 game, shall we? 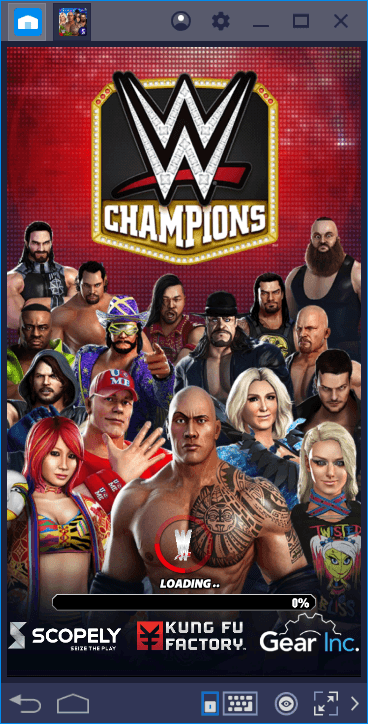 The game is extremely easy to install: Just type “WWE Champions” in the search box on the BlueStacks home screen and press “Enter”. BlueStacks will find the game in a few seconds and you can start the download by pressing “install”. The game is 80 MB in size and it will make an additional 70 MB download after the first launch, so you can start playing in a short time. BlueStacks will do everything automatically after you press the install button and will let you know when the game is ready to be played. The game doesn’t have a customizable control scheme because there is no need: Your goal is to create combos by switching gems on the screen, as we’ll explain in more detail below. You can do this with your mouse and there is no need to use another control tool to play WWE Champions. 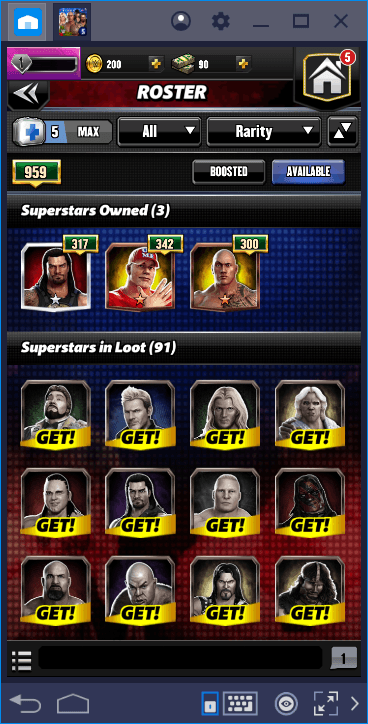 The interface of WWE Champions is divided into two: On the top, you see the wrestlers. 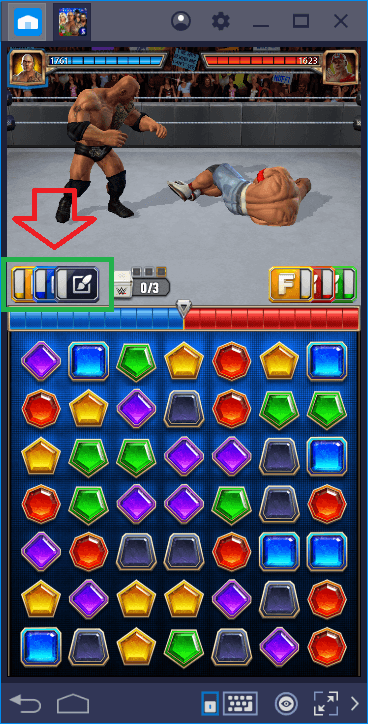 At the bottom is the “gem-match” interface. To fight your wrestlers, you have to match at least three gems: You can create a horizontal or vertical combo. The more gems you match, the stronger your wrestler will attack. The rules are not very complicated, so if you’ve played Candy Crush before, you’re ready for WWE Champions too. Seems simple, right? It’s really simple to play, but WWE Champions has a complex battle system. Each wrestler has special abilities and you have to collect gems of certain colors to activate them. To find out which colors you need, just check the boxes below your wrestler. 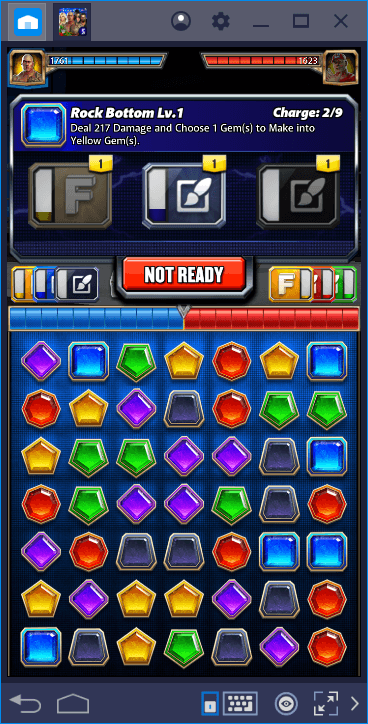 In order to activate Rock’s special abilities, we must collect the black, blue, and yellow gems. After collecting enough gems, we can activate that ability and inflict heavy damage on our opponent. Your goal is to activate the “pinned” feature after you have severely damaged your opponent. Pay attention to the bar just above the gems: The more you advance this bar to the right, the closer you are to getting the “pinned” bonus. After activating the pinned feature, we are seriously damaging our opponent for a short period of time. When this bonus gets triggered, you are about to win the match. WWE Champions allows you to collect a large number of wrestlers and make them more powerful in a variety of ways. By raising the level of a wrestler you can make him cause more damage, and by unlocking the “signature moves”, you can make the fights much more fun. It is also possible to unlock several different costumes too – these will be cosmetic changes, but they are still a thing to track. There are 91 superstar wrestlers you can collect and each is perfectly modeled. 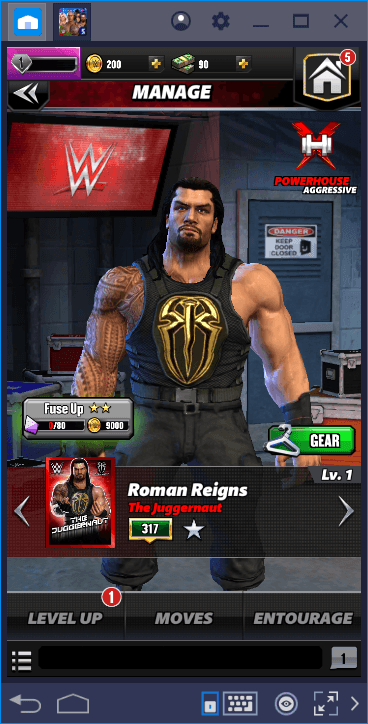 From this screen, you can change your wrestler’s costume and increase his level & unlock new moves. 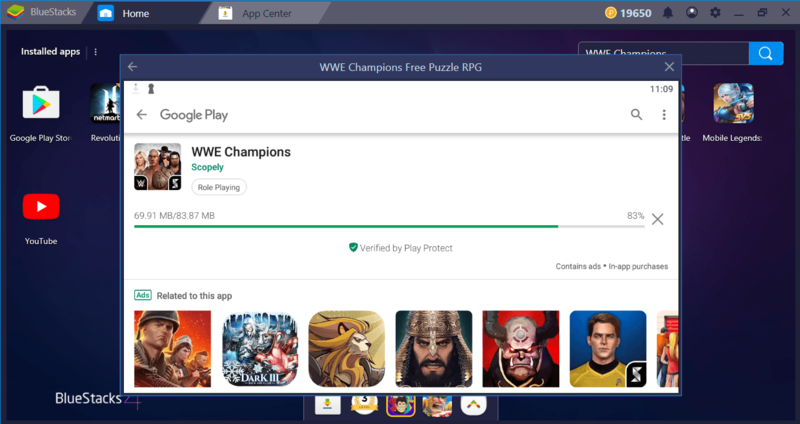 WWE Champions is like Candy Crush on steroids: It offers simple gameplay using match 3 mechanics which every player knows by heart, but it also includes features that will deepen the gameplay. It also offers almost 100 different wrestlers to collect and multiple ways to make them even stronger. In other words, we can easily say that WWE Champions has content that will keep you busy for months. As we said, if you are looking for a casual and fun game with match-3 mechanics, you should definitely look at WWE Champions. In our Tips Tricks guide, you can find a lot of advice that will make your work easier, so we encourage you to continue with reading it. See you in the ring!